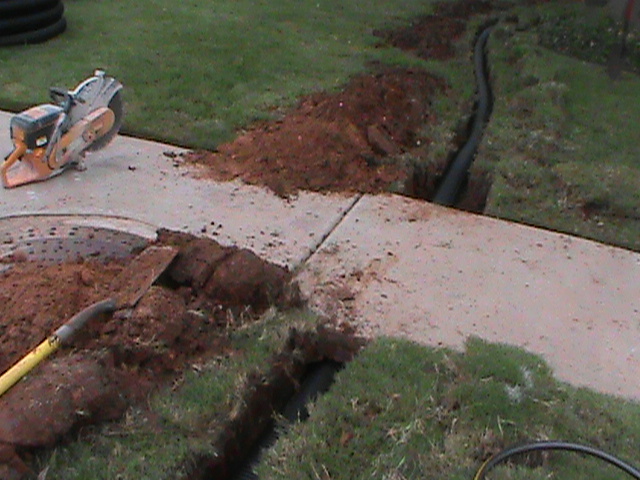 CMG Installs Drainage Systems in Oklahoma City, Norman, Edmond, and all of Central Oklahoma. 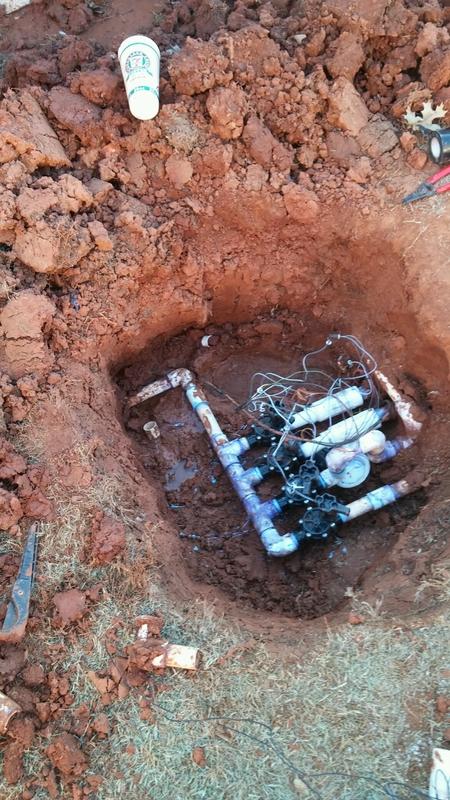 CMG Installs all types of Drainage Systems in Oklahoma. 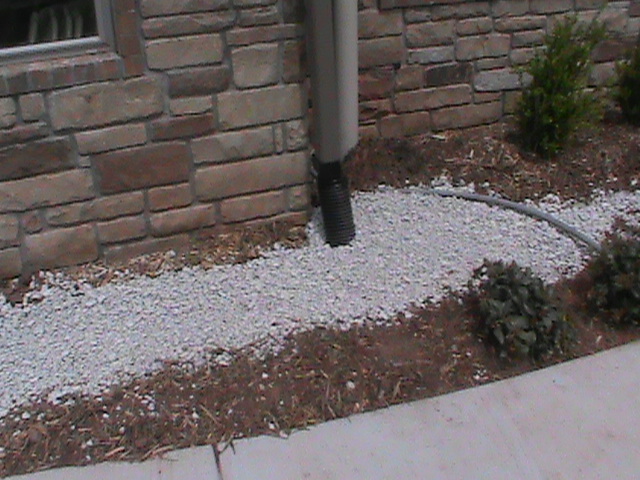 Today we installed a 6 Inch French Drain at an apartment complex near Lake Heffner. The French Drain started in the back yard of one unit. The Drain Pipe went under the fence and into the adjoining unit’s back yard. The French Drain then looped around their patio and out under their fence to the west. To get the 6 inch Drain Pipe to the correct Exit Point, we had to cut out 30 feet of sidewalk and run the French Drain Pipe under the sidewalk. Next, we replaced the sidewalk with new concrete. Finally, we dug a drainage ditch across the front yard to the parking lot. We covered the Drain Pipe with sod that we carefully removed when digging the trench. At the edge of the parking lot a 6 inch Pop-Up Emitter was installed to release the Storm water. Seven Gutters were connected directly into the Drainage System along the way. This particular Drainage System was made up of 55 Feet of 6 inch French Drain, 78 Feet of Solid ADS Solid Drain Pipe, Seven Gutter Connections, and one 6 inch Pop-Up Emitter. French Drain Design must take into account many variables. One consideration for a French Drain that many times is missed, is the type of soil. French Drain Design must take into account the type of soil that the French Drain runs through. 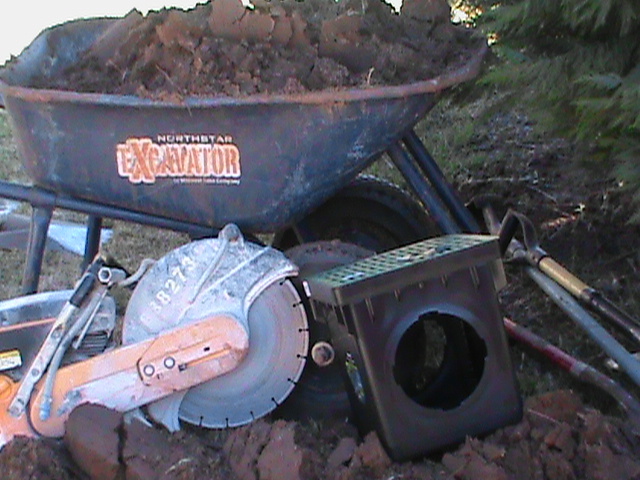 If the soil is “Tight or made up of Clay, A French Drain Liner may not be necessary. The Gravel or Limestone that is used to fill the French Drain trench may be all that is needed to maintain the integrity of the trench over time. This means that dirt will not mix in with the French Drain Gravel and clog it up over time. This is not the case however if your soil is sandy or loose. A Trench Liner should be used to prevent this type of soil from moving into the gravel of the French Drain. Trench Liners are relatively inexpensive and are not hard to install. If you are not sure what to do then install the Trench Liner in the French Drain. Determining the size of the French Drain Pipe can be difficult. If the French Drain is not very big and has no Gutter Down-Spouts or Surface Drains connected to it then 3 inch or 4 inch French Drain Pipe may be used. If the French Drain is large or has many gutters or Surface Drains connected into it, then you should use 6 Inch French Drain Pipe or larger. French Drain Design is also determined by the Problem Drainage Area. If water is moving into the Problem Drainage Area underground (Sub-Surface), then installing a French Drain is a “Must!” French Drains can move Sub-Surface water as well as Surface Water. Surface Drains can only move Surface Water. This is why French Drains do such a good job protecting driveways, sidewalks, and foundations. 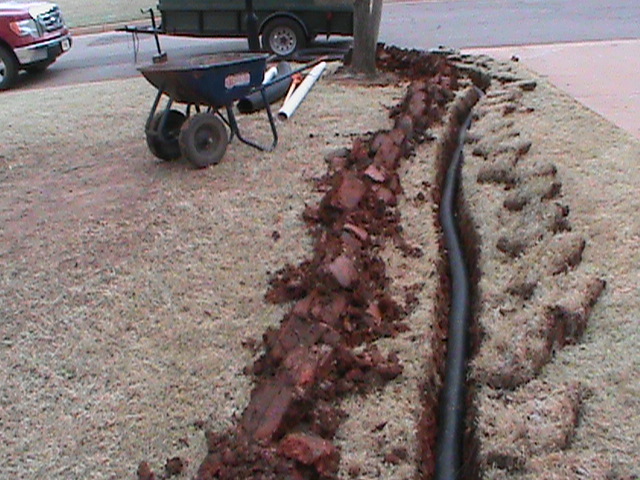 CMG installs French Drains and Drainage Systems in all of Central Oklahoma including: Oklahoma City, Norman, Edmond, Moore, Mustang, Yukon, and Midwest City. Drainage System Installation, Gutter Down Spouts Connected. Don’t let standing water or storm water run-off damage your home! 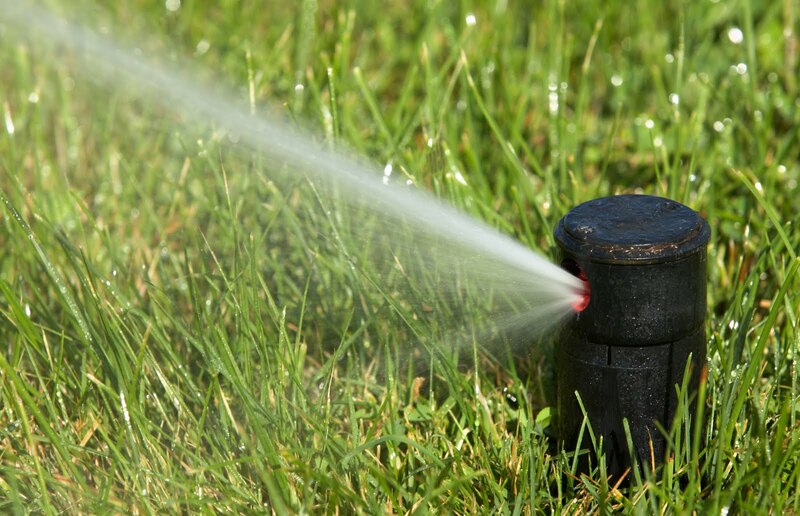 CMG Sprinklers and Drains can help with Drainage Problems in and around your home or business. If you have water standing in the wrong place after a hard rain, a Drainage System can be a great solution! If your sidewalk turns into a moat after a storm, or if your back yard floods from run-off from your neighbor’s roof give CMG a call. 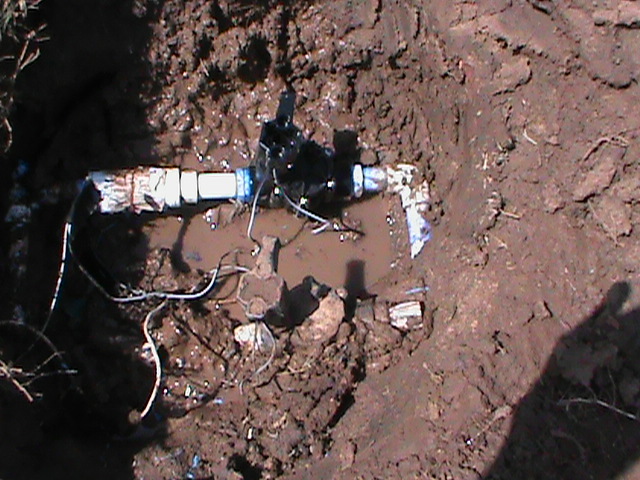 CMG can quickly diagnose your Drainage Problems and provide a solution. We incorporate several types of Drains in our Drainage System depending on the Drainage Problem. CMG installs: French Drain, Surface Drain, Channel Drains, Basin Drains, Trench Drains, and Sump pumps.We install Drains in lots of places including, Yards, Flower Beds, Driveways, Sidewalks, and next to Swimming Pools. 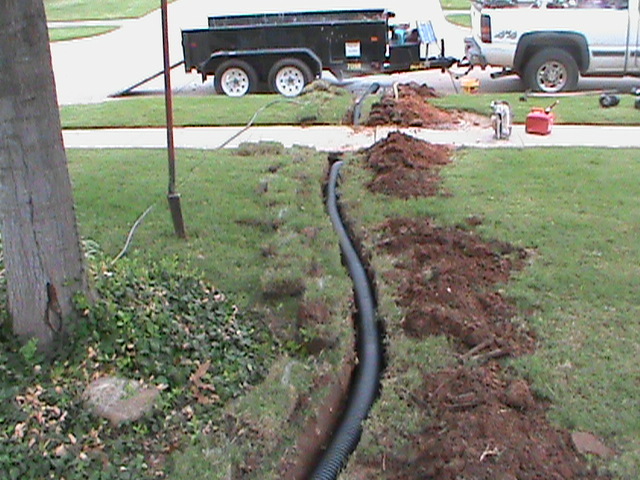 CMG installs Drainage Systems for home owners and Realtors who are in the process of selling a home. Sometimes a Drainage System must be installed before closing. We are more than happy to help! 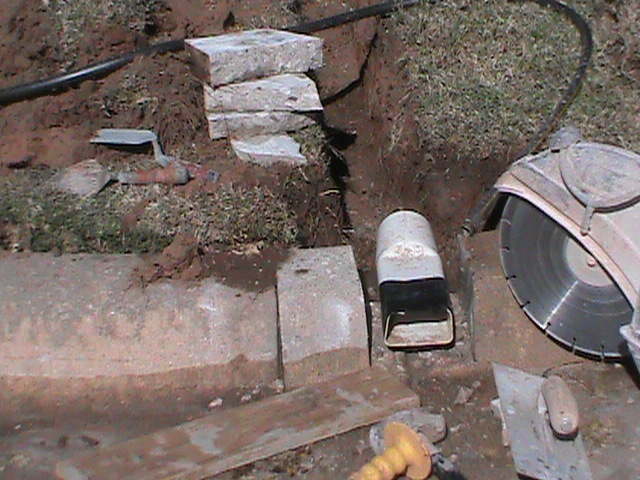 This concludes,”French Drains Oklahoma City, Drainage Systems, Surface Drains. New Sprinkler Valve next to an old one. 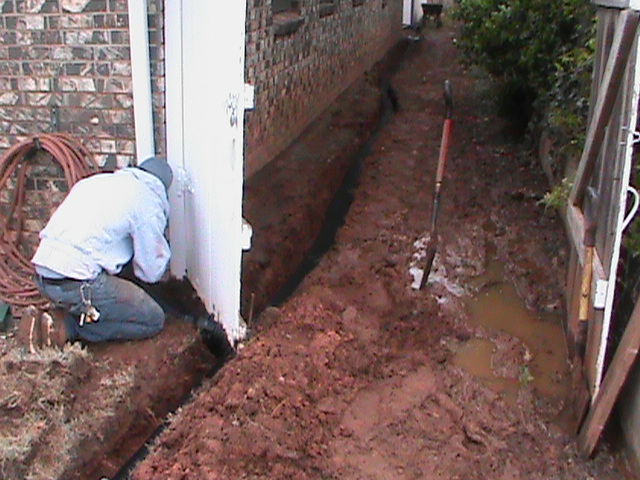 French Drain installation is a big focus for CMG during our 21st year in business. A French Drain is one part of a Drainage System. A French Drain can be connected to other types of Drains or Gutter Down-Spouts and then run through Drain Pipe to an Exit point where the water is released. A Drainage Exit Point is the area where water goes to be released when it comes out of the Drainage System. The two most common exit points for a Drainage System are a Pop-Up Emitter or a Curb Fitting. A Pop-Up Emitter is a Fitting on the end of a Drain Pipe that has a lid that pops up and releases water. When water drainage is complete, the lid shuts back. 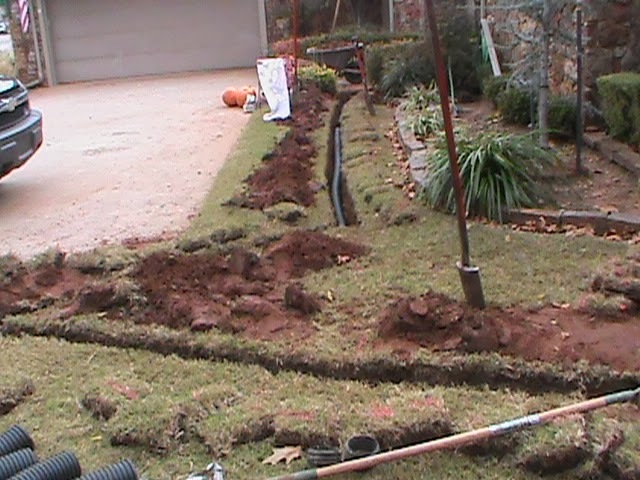 Installing French Drain and Curb Outlet in Drainage System in Norman. Curb Fitting installed — Waiting for Cement to dry!